Known variously as Money Wheel, Big 6 Wheel and Wheel of Fortune, this familiar game is based on a popular carnival attraction that has its roots in the days of chariot warfare. Because of its popularity and easy-to-play premise, Money Wheel is probably the first game you’ll see when walking into most casinos. It usually has a crowd pressing in from all sides, gasping and cheering as the wheel comes to a full stop. Part of the thrill is watching with anticipation as the wheel slows down and each outcome passes by more slowly than the last. Will it stop on this one or keep on to the next? We cannot use real money on any of the Money Wheels at your casino night party. We furnish two-sided tickets for drawings on prizes, as well as provide fake money to start the party. 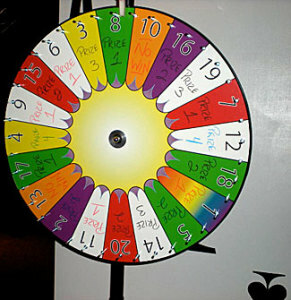 Contact Wow VIP Events today to experience the thrill of the Money Wheel at your next Casino Party. Call us at 972/300.4100, or fill out our Request a Quote form.